Art Day Meetup is coming early in July. 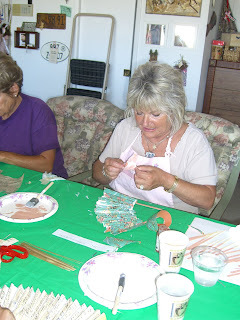 We’re having a guest instructor, Miss Vicky, of Cut-It-Up in Dutch Flat, California. She’s bringing some amazing fun for us to create and expand our artist knowledge. I hope you can come and join us for one or all of the classes. Here’s some information and pictures to wet your appetite. If you’re interested or want more information, please email me immediately. Charming Junque Necklace Class Cost: $35.00, Monday, July 14, 2008, Class hours: 10am – 11:30am(1-1/2 hours) Class will be held at Jane Pollack’s home in downtown San Diego. 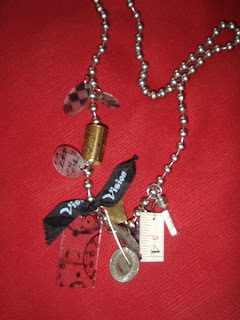 You will make a beautiful Junque necklace with charms including found objects, metal pieces and shrinky dinks. 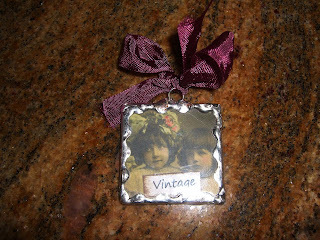 The necklace will be a large ball and chain silver type necklace. You’ll come and be able to create a one-of-a-kind art piece. 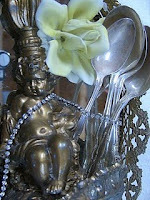 If you have a piece of silver that is sentimental to you or any special embellishments, bring them. Otherwise, everything will be provided, including a piece of silverware. 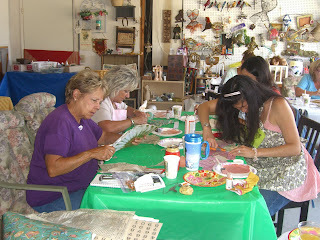 During this class you will learn the techniques to transfer images to cloth. 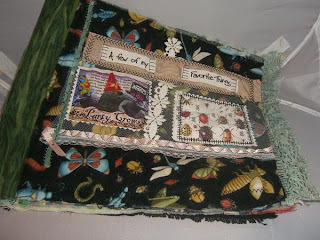 You will be making a 4 to 6 page cloth book (with 6 - 12 images) with your own special images. If you don’t have any images, we’ll have some for you. Miss Vicky philosophy is that each piece of art you create will be a unique representation of the creator. So be ready to express yourself through your creativity. Get more information about Art Day Meetup by emailing me. 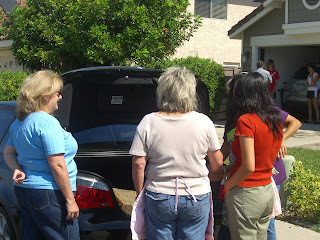 Can't wait...it's Barn sale weekend here in Southern California. If you haven't been, you MUST. 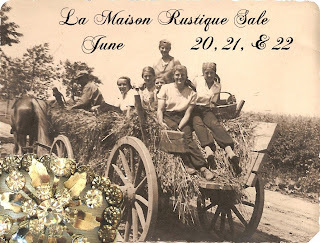 It's such fun to see all the wonderful shabby chic items and meet the ladies of the barn. It's their 1 Year Anniversay!!! Graphic provided by Hope Tree Studios.........thanks Denise, see you there! Go on over to her blog and post a comment and get a chance at winning one of her cute blog banners! So perfect for the summer.........beachy banner. Check it out! Abounded? Oh well, if that's not a word....let's just say there was alot of creating going on and with FABULOUS results. Some of the ladies had to leave before finishing....I just hate that! 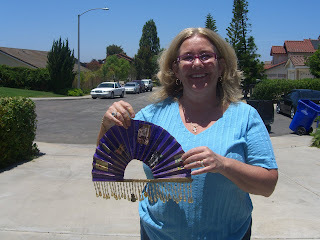 BUT, they said they would send me pics of their finished fans.....so DON'T forget. It was just so much fun. We had five new ladies this month Matina, Julie, Kathleen, Bet, and Sally which added to the excitement. I know I say it time and again but I am so blown away each time we come together because each person comes up with something completely beautiful and nothing I would have thought of......it just always inspires me. 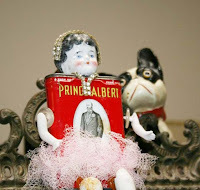 Okay so after the tour of Sally's trunk we gathered our art and started mod podging...gluing, glittering and adding lace with Sealah tape (love this stuff). 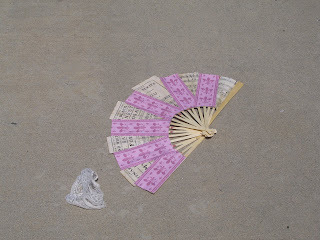 I think I'll be altering a few more fans........it was such darn fun. 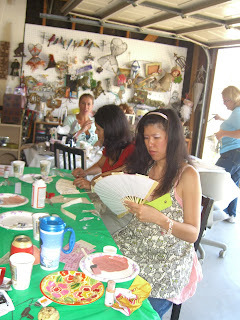 Next Art Meetup will be special July 14 and 15 when we have our guest instructor, Miss Vicky of Cut-it-Up.com. 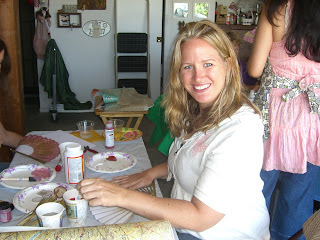 She's coming to San Diego to teach 3 classes. Check back this weekend to see the projects......they are awesome!!! 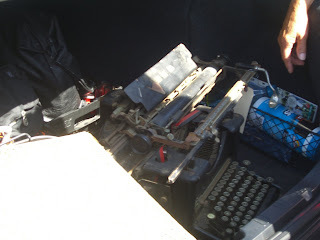 Oh an Sally paid just $5 for the typewriter WOW!!!! 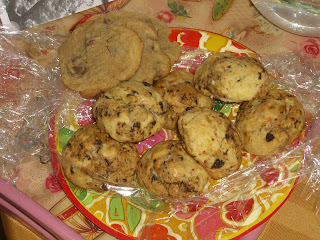 Also, a big thanks to Melanie for making yummy chocolate chip coookies. They were also scrumptous. 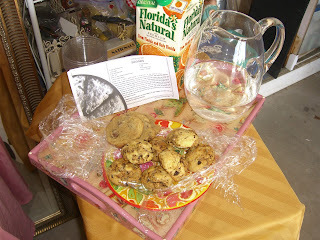 I had my cookies and milk as an afternoon snack. yummmmmmmm Thanks Mel such a good little baker. Send me the recipe! Preheat oven to 350 degrees. Lightly grease a scone pan. 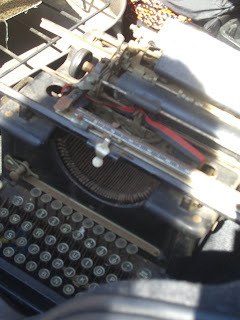 (I need one of these...where do you buy one? ):} In the bowl of a food processor, combine flour, sugar, baking powder and salt and pulse to combine. Add butter and pulse until mixture resembles pea-size crumbs. Transfer to a large bowl, add currants and stir to mix. In a small bowl, whisk together egg, cream and orange zest until blended and add to flour mixture. Using a fork, stir to form large, moist clumps of dough. Turn dough out onto a lightly floured surface and press together with your hands until dough comes together. Roll out dough, flouring as needed, into a 10 inch round about 3/4 inches thick. Cut into 8 equal size wedges and press each wedge into a well of prepared pan. Bake until scones are golden, about 25 min. Invert pan onto a wire rack and lift off pan. Let scones cool 10 minutes before serving. Makes 8 scones. Thanks for visiting.........come back soon! For those of you that are visiting to see what Art Meetup's are all about, I'm making it easy for you to check the earlier posts. 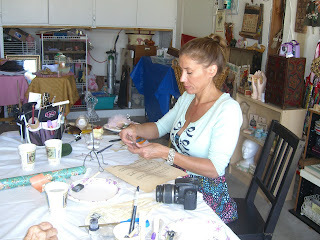 I have had 2 Art Meetups and lot's of inspiration and creativity has taken place. I hope that you can attend ESPECIALLY in June since I wanted to make it FREE so that everyone can get a chance to experience the fun and creativity. All you need to do to attend, is email me so I have enough supplies for you. I will repsond with my address and directions. Click here to email. 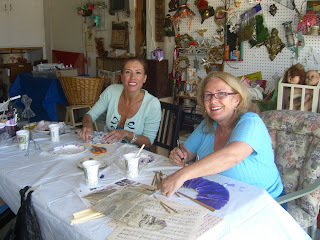 What we will be doing in June for our FREE Art Day Meetup. Hope to see you there, email me! As I grow older and hopefully wiser :} I feel I understand the words "it is better to give than receive". It used to be I was soooo happy and delighted when I received a gift (still am don't get me wrong:} but now it feels equally or even better sometimes to give and it doesn't have to be money. It can be our time or these days, our art. I love when my art touches someone else's heart. 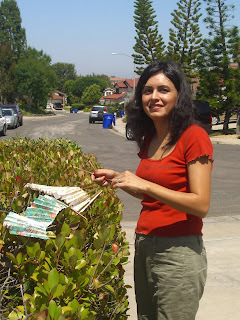 A friend and wonderful person, Dr.Maryam Davodi-Far, is Executive Director/Founder of the Cancer Coping Center she is in the early stages of planning one of their fundraisers, an afternoon tea on September 6, 2008. The Center is looking for donations for silent auctions items i.e. Handmade items and art, gift certificates, and or gift baskets. etc. If you can donate an item or two, contact Maryam and let her know what you would like to donate by July 30th so she can make appropriate preparations or email me for more information. Visit their website and learn more of what they do. They are a 100% volunteer run agency and your generosity is always appreciated. I am making a handmade piece of art for their silent auction but I would like to offer the following pieces of jewelry for sale to further their cause. 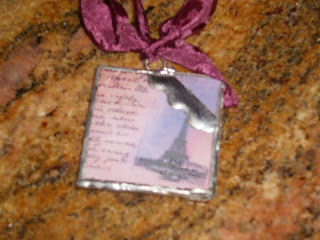 100% of the purchase price will be donated to the Cancer Coping Center and I will pay the shipping. You can pay with paypal or send a check made out the the Cancer Coping Center. Here are a couple items available at this time. Email me if you want to purchase or have questions. 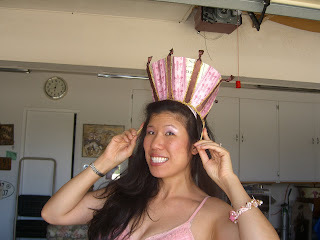 Also, you can support this cause if you're in the San Diego area by attending the tea...what fun! Email Maryam about that too! I call this Princess of Monaco Jewels. Isn't it beautiful? The necklace measures 16 inches long and the middle crystals measure 1-1/4 inches long. 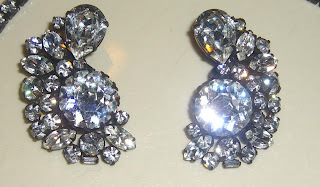 The earrings are clip and measure about 1-3/4 inches long and 1 inch at it's widest. 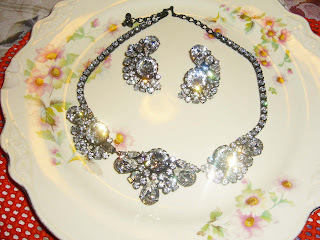 This set is a retro gem made of black metal and shiny rhinestones. All the stones are there and it is in mint condition. Cost/Donation: $48.00 Free shipping. Email me if you want em! 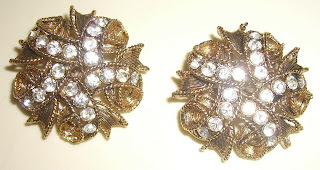 Cluster goldtone with rhinestone Clipback Earrings. 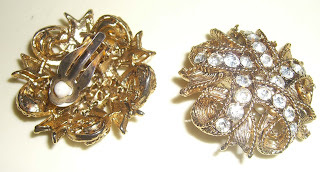 These are so retro, they're in :} Made of goldtone metal and contain 5 swirls of 4 rhinestones each. A total of 20 shiny stones in each earring. They measure 1-3/4 inches in diameter. 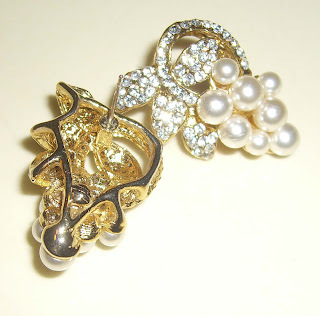 Beautiful goldtone with rhinestones and pearls pierced earrings. 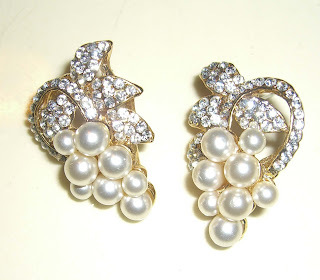 I call these the "grapes of love" earrings. You'll LOVE these earrings and others will LOVE them on you! They measure 1-3/4 inches long and have a nice weight to them. They sparkle with little rhinestones and they shine with lovely pearls. All these pieces of lovely jewelry have had homes before but have been cleaned and inspected to make sure when they arrive at their new home they will be like new! Email me if you want a piece of jewelry or have any questions. Until my next post....try a little giving and let me know how you feel. Art Meetup for June...Let's Get Creative! Summer is here and boy are we going to have alot of fun this summer. Starting off in June there is a FREE Art Meetup. Mark your calendars....June 17th, 10am. I want to fan the fires of creativity so I want you to come and enjoy a few hours of creativity and fun. 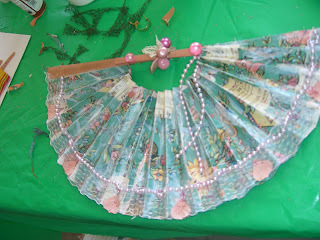 We're going to embellish, alter, collage and paint a fan. I know that each student's fan will be a reflection of their selve and hopefully we'll learn a few new techniques along the way. 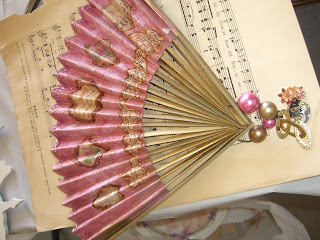 Here's a pic of my fan I made. 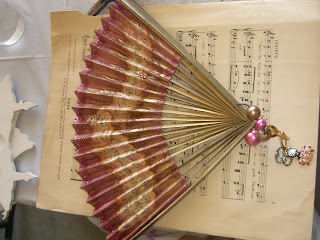 As I was making this fan, I started thinking of so many other ways to alter this fan. You know it doesn't have to end up as a fan....it could be a horn of plenty, a skirt for a doll, a wall hanging....oh so many things. See the lace along the top? 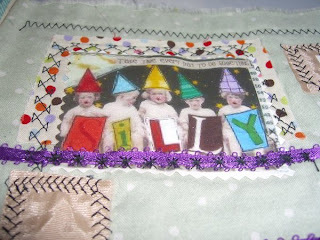 I adhered it with wonderful Sealah No Sew Tape from Jodde's Inc. I ordered some so you can play with it. It adheres quickly and strong....I know you'll think of other things to do with it. 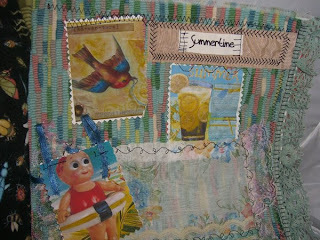 I will have everything you need but if you want to bring any scraps or embellishments to share, feel free. It's going to be FUN....don't miss it! Read more about Art Meetup by clicking here. Okay I didn't burn my fingers too badly ha ha Two friends came over yesterday and we did some soldering. 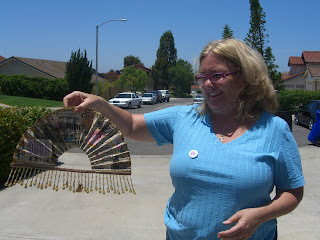 Alane of Art Sizzles brought her stash of supplies and gave Bonnie and myself some tips on soldering. I must say I learned quite a few good tips and had fun doing it. Now this was Bonnie's first time soldering and she was doing good after getting over that feeling of needing 12 hands to hold, solder, smooth, crimp but unfortunately the clamps we were using to hold our projects CrAcKed her pendant and I did the same thing bummer. But each session is a learning exercise right? Still if they hadn't cracked they would have been STUPENDOUS. I was able to "heal" mine by covering the crack on the back with a strip of solder...not too bad. 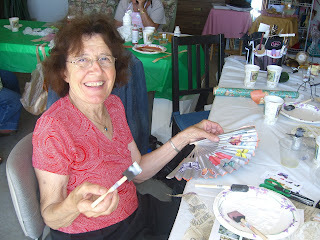 Alane had taken a class with Chris Cozen of Golden Paints and had worked on some great backgrounds with acrylics. 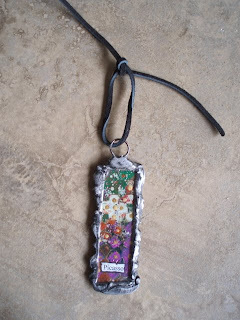 So she used her original as a background for her pendant and labeled it "Picasso".....she now thinks maybe it's more like "Monet". Either way, it is a piece of art! Don't you think? Yes, we're so lucky here in San Diego to have LOTS of sunny, great days. So today I decided to take off and check out a store in one of my old neighborhoods, North Park. 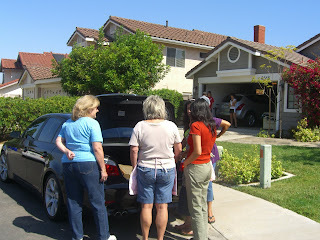 Some 20 years ago I lived in a small old house (oh I wish I had that house now :}in North Park. Fast foward 20 years later things have changed and it's now a revitalized cute little neighborhood. Looks like alot of fun boutiques and eatries to check out. 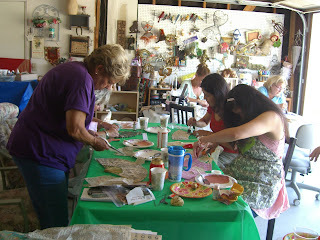 Jane of Art Takes A Village is doing some hands-on classes at a garden shop in North Park UNDER THE SUN. I wanted to check it and did. A cute and inviting little store with antique, vintage and handcrafted items and a variety of products from places far and near. I choose package mixes of lavendar margarita mix and lavendar limeade made in Hawaii. One for a gift and one for drinking yum! I also got a cute rusted litte wire fence....I know I can use it for some art....not sure what but I had to have it! Sandra, the owner, gave me directions to a couple little stores around the corner. A candle and soap shop and a book store with little boutiques inside. I checked both of them out. Very nice little shops. The candle and handmade soap shop is recyling candle wax which is so great.